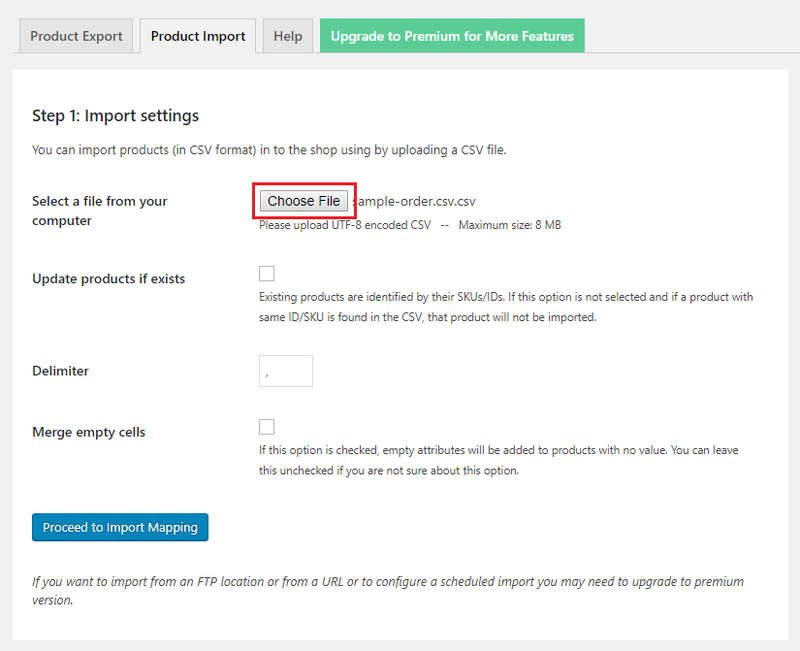 Product Import Export Plugin for WooCommerce is a free plugin that allows you to import products to your WooCommerce store from a CSV file and export products from the store to a CSV file. It is a great tool for your WooCommerce store when you need to transfer product data to or from your store. To import products into your WooCommerce Store using the free Product Import Export plugin for WooCommerce, install and activate the plugin on your store. The plugin takes CSV files as input. Prepare a CSV file of all the products The CSV file should be UTF-8 encoded for an error-free import. Read Saving CSV/Excel file as UTF-8 Encoded. After the plugin has been activated, From the WooCommerce store admin side, go to WooCommerce > Product Im-Ex. From the plugin page, go to the Product Import tab. From the Import settings section, you can upload the CSV file from your local computer. Click on Choose File to browse and select the CSV file from your computer. Then, configure the settings and click on Proceed to Import Mapping. The next page will take you to Step 2: Import Mapping section. In this section, you can map the column headers of the imported CSV to match the WooCommerce product data fields. After mapping the CSV file, Click on Start Import button. This will start importing all the products in the CSV and products will be visible in the WooCommerce store. With the basic version of the plugin, you can only import the simple products into the store. If the importing CSV contains product types other than simple products like a variable, grouped, subscription product etc., they will also be imported as simple products. To import all the product types into your store, you will have to opt for the premium version of the Product Import Export Plugin for WooCommerce. Hi, I have a plugin that gives a field in the inventory section of my products for a Barcode. 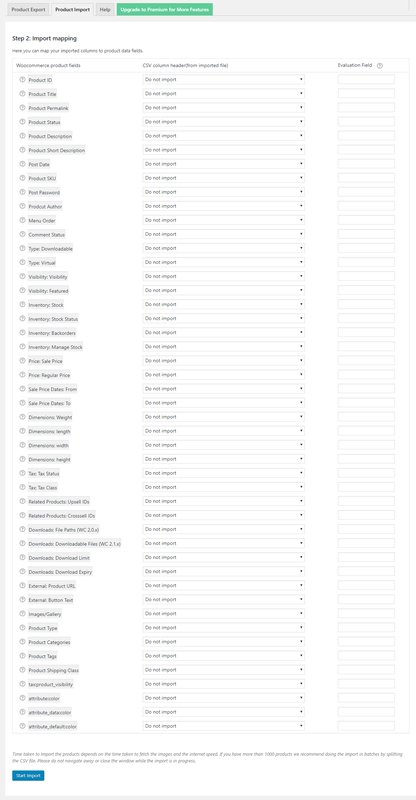 This field does not appear in the import mapping section when attempting to import products.